Are we being too punitive of teachers? 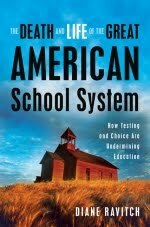 The "Death and Life of the Great American School System" is a book by Diane Ravitch. She claims that she was wrong about No Child Left Behind (NCLB) when she supported it. She also says that President Obama's path ahead is also not right. She says that charter schools are nice (3% of our schools are charters), but they are a distraction to the real goal. We have 97% of our schools that we should be focused on and worried about. My question to you is, what do you think the role of the national government should be in the years ahead? I am super excited about teaching a lesson on Monday that I'm calling "DBQ Football AHS." It's a take on something I have seen at AP conferences before. Basically you give students documents that correspond to a football game and they piece them together to explain it in essay form. That's basically what a DBQ or Document Based Question is. So this is great practice. I'll write more about how it went on Monday. But, my plan is to have them work on this individually for about 10-15 minutes. They will need to read the documents, analyze it for APPARTS (Author, Place and Time, Prior Knowledge, Audience, Reason, The Main Idea, Significance) and then write a thesis. Then we'll get into groups to compare thesis statements. At the end of the period, we'll try to pull together one great thesis as a class. Are kids today needing "recess coaches?" Elkind is a professor of childhood development at Tufts University. His column here has me thinking about growing up and what we did as kids. Many days (I grew up in the 70s for grade school and middle 80s for high school - graduated in '88) we would go to the local elementary school and play at the playground or start a pickup game of basketball, wiffle ball, or kickball. We also went sled riding a lot when it did snow. We were outside a bunch. Unlike most kids though, I was very, very athletic. I loved playing ball as a kid. I know that not every kid was like me. I agree with Elkind that schools are definitely going in the wrong direction with education at the younger level. Any high school teacher can tell you that there is a problem. We see it when kids show up to us each year. I catch my students up, but believe me, they are coming with hugh deficits. That is not an excuse. My job as an educator is to make them better and to improve each student. Most of my students improve a great deal and I am proud of that work. But, I would be ecstatic if there were changes in the focus of elementary education. A physical education is in many ways just as important as the academics. It's like the balance between character ed and academic excellence. I tell my students all the time, "No one is going to care how smart you are if you are a jerk to everyone." It's true. It is also true that a person is not going to be able to enjoy their intelligence and progress academically if they are living unfulfilled lives because of a lack of physical fitness and health. As a former college football player and baseball player, I also know the other side of this coin. There are student-athletes in our schools today getting too much physical work and not enough academic work. Today in Texas (the high school football capital of the world), student-athletes take a class called FOOTBALL. During the school day they have a period set aside for athletics. They also then practice after school. Some programs also require kids to come in early before school begins to run, practice during the day for athletic period and then practice after school. That's too much. Anyone can see it. And I can tell you story after story of very talented high school athletes that go off to their college or university of choice and immediately quit the athletic team because they are just flat burned out. As Julia Child once said, "Everything in moderation, including moderation." Maybe that's the answer. I look at things through my perspective. That perspective is as an educator and also a father of a five year-old son. I worry about him being pushed too hard. People are always saying to me, "What sport is he doing?" Well, he's freaking five! I started baseball, basketball and football when I was six. And I distinctly remember that my dad forged the form to say I was seven so that I could play. I am in no way going to do that for my son. Last fall he wanted to play soccer, so he did. Last summer he wanted to try swimming, so he did. The year before he took karate lessons for 3-5 year olds. No big deal to me that he isn't continuing either of them at this point. He is trying some things and making decisions about what he wants to do. Pushing him down the road is not going to keep him on that road. I want him to come to athletics if that is what he is compelled to do. But, if Aidan decides to be in the band, to form a rock band with his friends, to join the chess club... so be it! 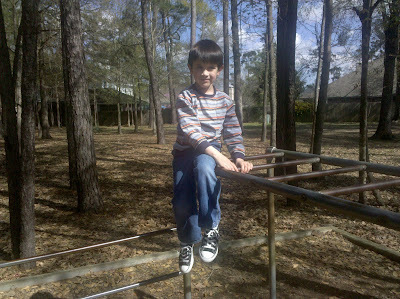 But, I will be trying to foster an active childhood where his physical fitness is improving. So this is really two topics in this blog post. One is of the failure of too little. The other of the failure of too much. The answer I suppose is something in between. Today was our Teacher of the Year announcement during our PLC time (we have Professional Learning Community time on Thursdays from 7am to 9am every week. Students have late arrival). It is always emotional for me because I was lucky enough to win our first ever voting during the 2006 school year. Winning during the very difficult first year of our school was one of the greatest professional accomplishments that I have ever had. So today when they named Ms. Adkins, I was emotional. The first reason it is emotion is because of how our principals do the announcement. At some schools I have been at, the principal would just stand up there and say, "The Teacher of the Year is ____." Yeah. Nothing too special. My wife has been at schools where they just announced it over the loud speaker during school. We do it up at AHS. They have all of the faculty in the PAC (our fancy name for Auditorium - Performance and Arts Center) and they play a video. The video has quotes from students about our teachers. There were probably 30 or 40 of them. They show a picture of the teacher, their name and the quote. The video is quite emotional because of the wonderful things the kids write. At the end they have drum roll, show the finalists one last time and then the winner appears on the screen. Very exciting. 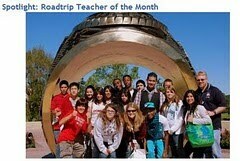 They also give us a Teacher of the Year ring. I wear mine every day. The first thing that I did was send our winner this year an email with my essays from the year that I won. It is a really quick turn around to get the essays in and be considered for District Teacher of the Year. So I wanted to give her a heads-up. But I did warn her that I didn't want any kind of feedback about them. She is known as the "Grammar Queen" at our school and I know how critical she can be about writing. :) But that is just one of the reasons she is such a great teacher. So I though I would share my essays with the readers of this blog as well. It has been a long while since I won 4 years ago. I am probably 10 times the teacher that I was then. I have learned so much since 2006. One of the reasons I have learned so much is because I have been given opportunities because of winning Teacher of the Year. I've gone to conferences, trainings, taught professional development and been named an AVID teacher all after winning the award. It has helped my career. My kids always get upset each year because I tell them not to vote for me. The reason is that there are lots of teachers at our school who will never have the privilege of being recognized and winning. We have over 200 faculty members and we have a very large school. So each year I basically want my name off the ballot. There is no reason for me to win again. But, still I had about 12 kids write a nomination and it was great to read what they wrote. It is wonderful to be acknowledged and wonderful to feel appreciated. I hope all teachers have the chance to feel what I have been able to experience as a teacher. Here are my essays: TOY Essays From 2006-2007. Ken Robinson: "It's not like making motor cars." What do you think of what Sir Ken has to say? To me, he is on the money. But, how can schools individualize education? I think the only way is through the use of personalized learning that takes place through the use of technology. We are not there yet, but there will be a day when someone's laptop, iPad, eReader, or even cell phones will be all you need to conduct a class and receive a quality course in education. Nothing will replace one on one interaction and traditional classroom settings, but the use of technology will enhance it. It is my hope that having kids be able to take electives through a technology portal will increase their learning and skill level and that will, in turn, show improvements in the traditional classroom. We'll see. This is a fascinating article: Building a Better Teacher on New York Times.com by Elizabeth Green March 2, 2010. Yet in recent years researchers have discovered something that may seem obvious, but for many reasons was overlooked or denied. What really makes a difference, what matters more than the class size or the textbook, the teaching method or the technology, or even the curriculum, is the quality of the teacher. 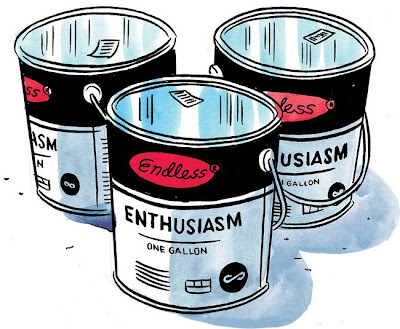 Much of the ability to teach is innate—an ability to inspire young minds as well as control unruly classrooms that some people instinctively possess (and some people definitely do not). Teaching can be taught, to some degree, but not the way many graduate schools of education do it, with a lot of insipid or marginally relevant theorizing and pedagogy. In any case the research shows that within about five years, you can generally tell who is a good teacher and who is not. The article from Newsweek centers on the premise, that basically you can either teach or you can't teach. I understand what they are saying, but that leads to --> "Fire the bad teacher." And it is not what we are saying about our students, is it? Do we say, "Kids can either learn or they can't learn!" and "If they aren't learning, get them out of school those darn kids!" No we don't. We subscribe to the theory that all kids are capable of improving their learning. So why should it be any different for the teacher? Can't all teachers improve and do better for their kids? Isn't it much more economically efficient to improve the current stock of teachers and make their jobs more meaningful to them and our students by helping them improve? I'm curious what you think about all this? I'm sure the real answer is somewhere in between. Are there teachers that need to be removed from the job? Most definitely. Are there teachers who would show remarkable improvement if given some support, techniques and help? Absolutely there would be. But, how will you know who they are until you apply the support in the first place? We have to start trying. Of course, a lot of the burden falls on the teacher. If you are going to sit there and say, "My school won't support me," well, you have already lost. Get out on the internet and find help. Take professional development over the summer. Seek out mentor teachers. Observe classes - good and bad. Find ways to improve and keep tweaking what you do. By putting the effort into it, it is my opinion that you will naturally begin to improve. From good to great. In these video clips from actual classrooms around the country, Doug Lemov, founder of the charter-school network Uncommon Schools, analyzes techniques that effective teachers use to get students to pay attention and follow instructions. We have a new Facebook group of teachers at our school. It just started this week but it has already been very supportive and positive. One of the teachers posted a question, "What has been your most memorable teaching moment?" Cat blogging. Me and my Suki. David Duez "Most memorable moment" - this really had me doing some searching this weekend. I have been lucky enough to have many, many memorable moments. I have been in a classroom since my freshman year in college ('88) and had my own classroom since student teaching ('92). 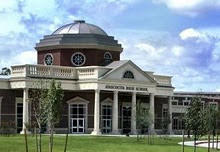 After leaving teaching in 1997, I returned in 2004 at Humble High. I believe this year was my most memorable because it was so difficult in so many ways. Aidan was born in October and sharing that birth with my students was incredible. They were so excited. But, that still wasn't the most memorable. A teaching colleague and friend that shared the lone teacher lounge with me during third periods was Mr. Braunstein. We shared a lot in common, both from the north east originally and both teaching World History. He had all of the pre-AP classes. Near the end of the semester, he was absent a lot. One day he came in and said he was being forced to retire due to health reasons. He asked if I would take over his pre-AP classes. He said that our schedule is the same and a new teacher could just take over my classes and I could slide into his. We checked into it and the principals were all for it. So he was going to retire on the last day of the fall semester and I would take over his classes in January. Over the holiday break Mr. Braunstein died. It was terribly sad. I will never forget that first day with his old kids and my new ones. For most of them I was giving them the news that he had passed. Facing them alone that day was probably the hardest thing I had to do as a teacher. But, I really grew from it. At his memorial service I realized just what an impact a teacher has on their student's lives. There were so many kids there and kids that had Mr. B years ago and had since graduated. I looked around and realized that a teacher's impact is large indeed. The next year I would lose my mother-in-law, my grandmother, and then my own father. My students helped me through that pain and I realized I had support that I never had during my days in corporate technology. We, as teachers, are a big part of our community. That community can be a big support to us through our roughest times. The next school year I had Zach Jones in class when he passed away due to rabies. The pain was unbelievable. But, we all worked through it together. My most memorable moments are some of the toughest that seemed terrible at the time, but today I enjoy thinking back on how strong we were. I also realized in these moments that teaching is important but it isn't life and death. I have come to believe that kids make mistakes (as do I) all the time, but we have to cherish the time we have together because we never know when that time is going to end. The problem with the Estates General was that it was setup in a 3 vote system. The 3 estates each had one vote a piece. The 1st estate was the clergy, 2nd was the royalty, and the 3rd estate was everyone else (basically 98% of the people!). Each estate having one vote, it was easy for the 1st two estates to outvote the 3rd every time. So the first two would never pay taxes and the third would. Pretty quickly I determined that two young people sitting next to each other were both wearing crosses. They were the clergy! In the back we had a young man all dressed up in a suit and tie. He was obviously taking Communication Applications (Speech) and all dressed up for that. I said, "You are the king!" The young lady sitting with him was the queen. They represented the royalty. The rest of the classroom was the 3rd estate - everyone else. I gave them about 2 minutes to discuss it among themselves, how they would vote. 1st period very quickly formed an alliance between the first two estates and I had a great time laughing about how great my breakfast would taste on Monday. The third estate (all of the class except for 4 kids) immediately got upset. I said, "Are you upset enough to execute the king and revolt?" I then had the kids think about how they must have felt in France at the time. Starving and in the middle of a bread shortage. They were enduring the worst winter conditions in 90 years. No wonder they wanted to cut some heads off! It was a neat simulation because I could see the kids face react as we went along. Sure they can witness a video describing the three estates and how the Estates General works. But, when they were actually in the middle of it, it quickly became apparent how unfair it all was. 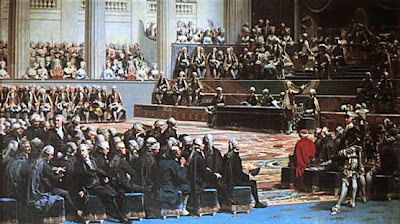 A meeting of the Estates General in France. Later in the day 5th period played the simulation, but it was for Mr. Duez's lunch on Monday. It played out exactly as in first period. The Third Estate was paying. But, in 6th period things were different, as they usually are. Of course, things did not play out how you thought they would. They had the clergy paying the tax. I was just shaking my head. So we had to discuss it a little longer to explain exactly how things worked during the pre-revolutionary days of France. Hopefully they understood what the heck was going on. But late in the period, one of the members of the clergy asked me, "Mr. Duez what do you want your Diet Coke in? A bottle or can?" Maybe Monday evening I'll be writing about my wonderful breakfast, lunch and diet coke? :) Hopefully during the test the students will remember the mess that was the Estates General. The result of the first meeting in 175 years of the Estates General? 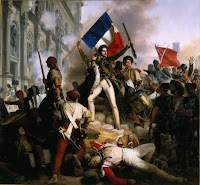 King Louis XVI had the doors locked the next day. 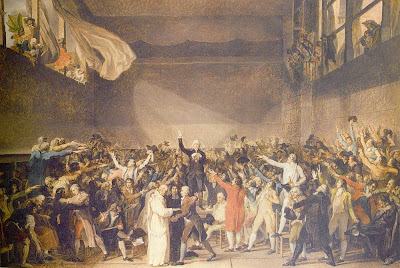 The members of the third estate went to the neighboring handball court and took what is called the Tennis Court Oath - vowing to meet until they establish a new government. They called themselves the "National Assembly." I really connect with this video because of my technology and educational past. I've been lucky enough to learn and be comfortable with technology. Anyone can do it though. It just takes making the first step, being creative and not being afraid to fail. Start small, then tweak things as you go or the next time you attempt it. My best advice - don't use a lack of technology as an excuse. It is amazing what funding there is out there and how just a little money can go a long way. I would also encourage teachers to ask their students what they would like to do. When I first started doing digital presentations in my World History classes I had no idea how to create a video myself. Through learning from my students I went a long, long way. It wasn't long until I was taking what they taught me and teaching it to other students. It is vital that we bring some of this technology into all of our classes. It is just how they are going to communicate when our students leave us and move into the real world. Sometimes I have a hectic schedule because of choir and dance, and my teachers were always available when I needed them. Sophomore year, my world history teacher was my favorite. I had history, usually a class that I dread, seventh (last) period, but I looked forward to it because my teacher made it interesting. He was very creative and let us be creative, too. When there was a project assigned there was always more than one way to accomplish it. My favorite project of the year was when we studied medieval castles; we were asked to build one, and kids arrived at school with castles built out of crayons, soda cans, marshmallows, and even sand. This teacher also told me about a program that our school has called AVID—Advancement Via Individual Determination. Part of the program is tutoring, and my history teacher got me a job tutoring freshmen at my school during an early release period. When students like their teachers, I believe it inspires them to put more effort into their classes, therefore giving them a better education and school experience. They wants their teachers to be proud of them, so they try their best and ask for help when necessary, leading to achievement that may not have come if they had only tried some of the time because they didn’t care what the teachers thought. I love my school because my teachers have been the best that I could have asked for. I was stunned because she was writing about me. It really made my day. I can't wait to see her and thank her at school. So kind of her. :) I am such a lucky guy. I officially have accepted a position to be a staff developer this summer for AVID. During the Dallas 1 and 2 Summer Institutes, I will teach History/Social Studies Strand 1. This is a super exciting opportunity. What a chance to make a difference and help other teachers improve. Over the past two years I have been teaching this class to my district through our local path training for AVID. I am prepared. It will be great to be able to learn from other great teachers and, in turn, teach them a few of my tricks. In April I'll be heading out to San Diego for a Fri-Sun training to get prepared. I can't wait.